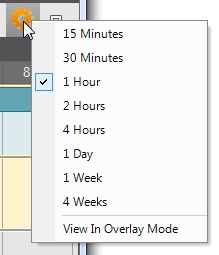 Click the "Timeline" tab on the main window. Click the "Timeline" command in the Go menu. The Timeline View enables you to visualize your schedule horizontally with timeslots arranged left to right. The displayed time interval can be adjusted anywhere from 15 minutes to 4 weeks, enabling you to drill down into the events of a particular date, or see a big picture of activities spanning several months. Each visible (or checked) calendar in the Calendar List is a row. Tasks and notes are also shown as rows, if the display of those data types has been enabled in the View menu. The Timeline View is very similar to the format of TV Guide, but instead of each channel being a row, it's each calendar. The height of the calendar rows can be adjusted to enable more rows to be displayed simultaneously. To do this, click and drag a row's top or bottom border. You can then make the row taller or shorter. When satisfied with the row height, release the mouse button. All other rows will also be adjusted to match the selected row's height. Clicking the "gear" button in the upper-right corner of the Timeline View will result in a menu appearing where the Timeline View settings can be modified. These options enable the displayed timeslot interval to be adjusted. 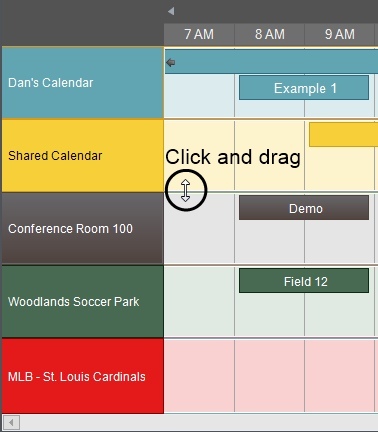 When this mode is enabled, instead of each calendar being a separate row, all calendars will be overlaid into a single row, as shown in the example below.